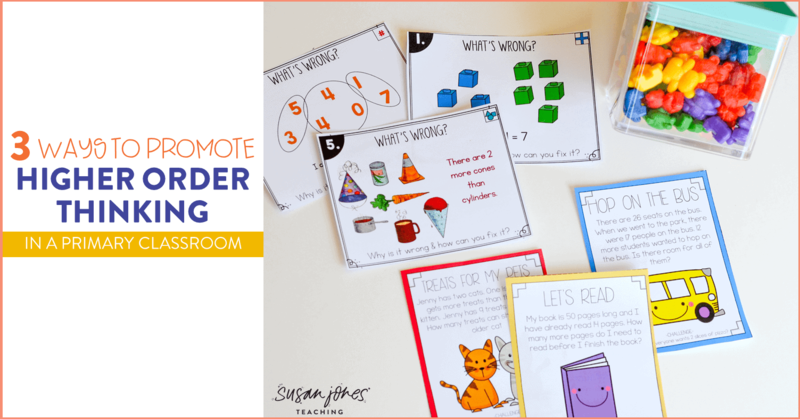 Three Ways to Promote Higher Order Thinking in the Primary Grades! 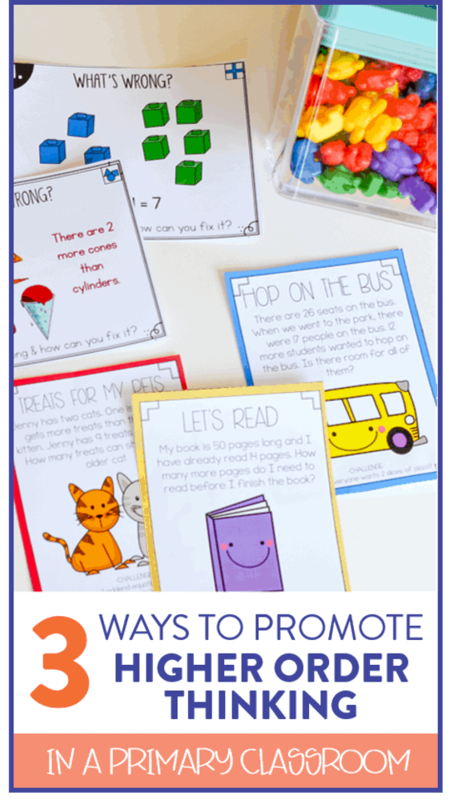 This post is also featured on the TpT blog. When I am talking about my students and higher order thinking, I am talking about the ability to use critical thinking skills to transfer their knowledge in order to solve a problem. Well that wasn’t the most simple way to put it… but essentially I want my students to take all the tools I have taught them and be able to APPLY them in order to solve something! 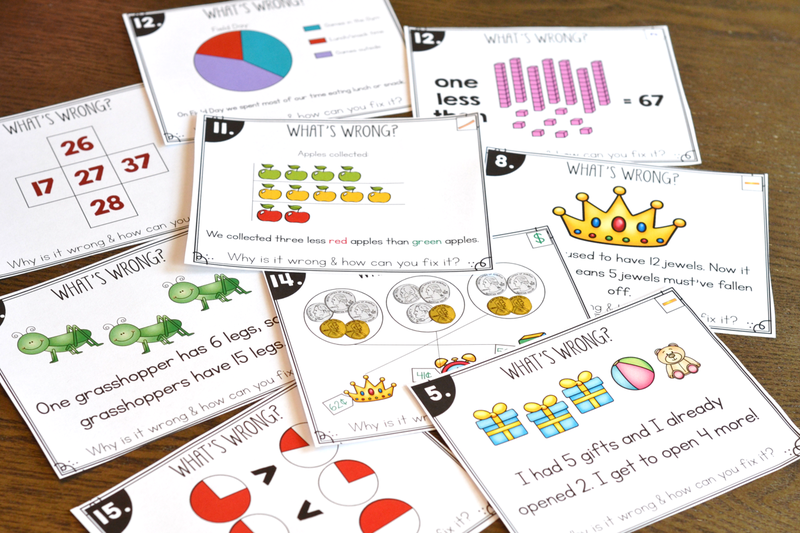 Higher order thinking can seem like a big task when talking about teaching 5-7 year old students, but it is honestly one of my favorite ways to teach. I love to watch my students surprise themselves with what they can do! I can see it in their eyes when they are at first, taken aback by the problem, and then when they solve it, they are just so proud. It is a beautiful thing! I believe the earlier students are exposed to higher order thinking type questions, the more they will feel prepared to solve these problems as they continue onto the higher grades and be put in more complex situations. 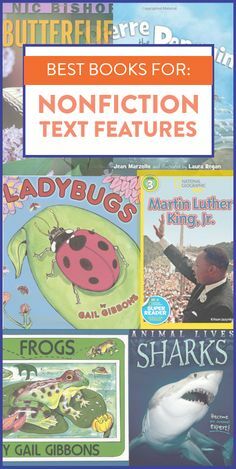 While these types of tasks are certainly difficult at first, they are great practice for your young learners to start thinking in different ways. The more practice and exposure they get to these types of problems, the better they become! 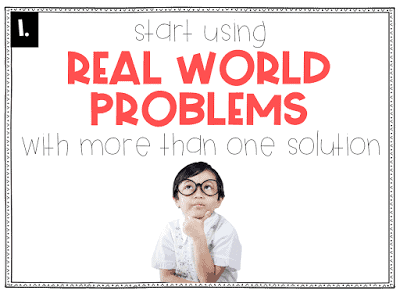 Once your students have learned a skill, I like to have them apply it to many different types of real world problems. By giving your students open ended tasks to solve, it gives them the freedom to solve the problem however best fits their needs. It also lets them recall their own past experiences to help them solve a problem and bring their learning outside the school walls! When you sit back and watch how your students solve these types of problems, you learn a lot about the way each child thinks. You see strengths and weaknesses that may not be readily assessed through simple “recall” questions. – You are having a big party and everyone in the class is invited! You want to bring in cupcakes but you need to know how many boxes to bring. There are 4 cupcakes in each box. 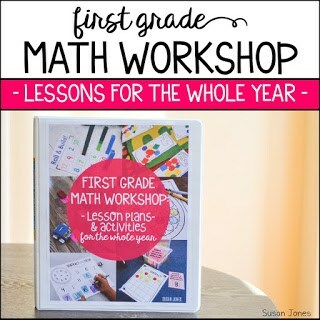 Students will first have to count up everyone in the class and brainstorm ways to figure out how many boxes of cupcakes they will need. – You get to pick out some new furniture to go along the biggest wall in your room. The wall is 15 feet long and your mom/dad want you to get a chair, a dresser, and a new bed. How long should each piece of furniture be to make sure it all fits? – Our principal said we can choose which kind of new recess equipment we can get for the playground! What should we get and how can we decide fairly? Students will likely suggest taking a vote and will need to decide on which options to put up on the board and how to collect and analyze the data. – Bring in a Hershey chocolate bar (or draw a rectangle on the board) and explain that you and 3 friends would like to share it equally. How can we go about doing this? This is an easy visual and when i do this in small group I actually give my students the candy once they have divided it up equally – boy that makes them want to get it right! Students mention all the different ways to divide the rectangle shape into equal parts and we discuss whether there is a “best” way to do it or not. – Your after-school piano lessons are an hour long and you must be home by 6pm for dinner. What time should your piano lessons start? This type of problem has students thinking about all sorts of real-life situations. When I use a word like “should” it puts pressure on my students to think of the best time for the lessons to start. Students will start to discuss what time school gets out and how long it might take them to get to the lessons and then back home in enough time for dinner. Of course, there are a few different answers to this depending on what time you get of school. 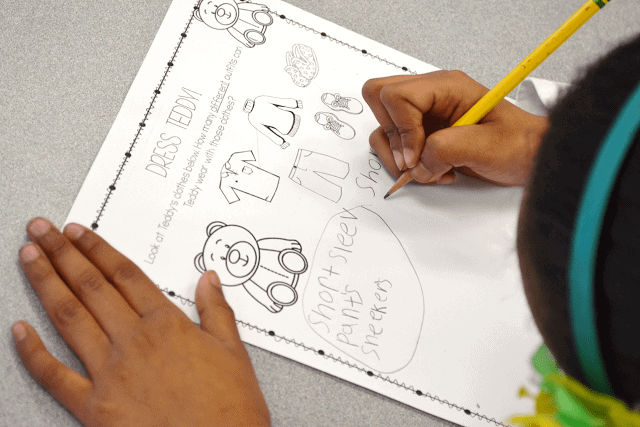 Students look at the different clothing options to dress their teddy bear and figure out how many different outfits they can make. This type of problem really shows the different ways my students think! Some students like to write down all their options, others draw pictures, others like to go through each clothing item 1-by-1 to make sure it’s being used. All of these are just perfect! 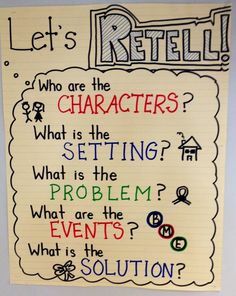 I like to pose these types of questions in whole group or small group situations. My students tend to bounce ideas off one another as many of these tasks are multi-step and can take a long time to solve. Once one student gets started sharing their ideas or strategies, it starts to spark other students’ ideas! You can do this simply by purposely doing something WRONG! 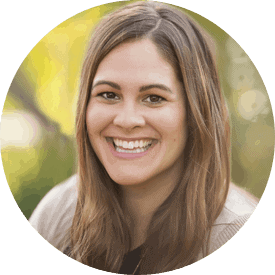 Now, of course, you only want to do this after you have taught something correctly and after your students have mastered the skill… and you may want to add a little theatrics to it while you are making a mistake to help your students catch the hint…. 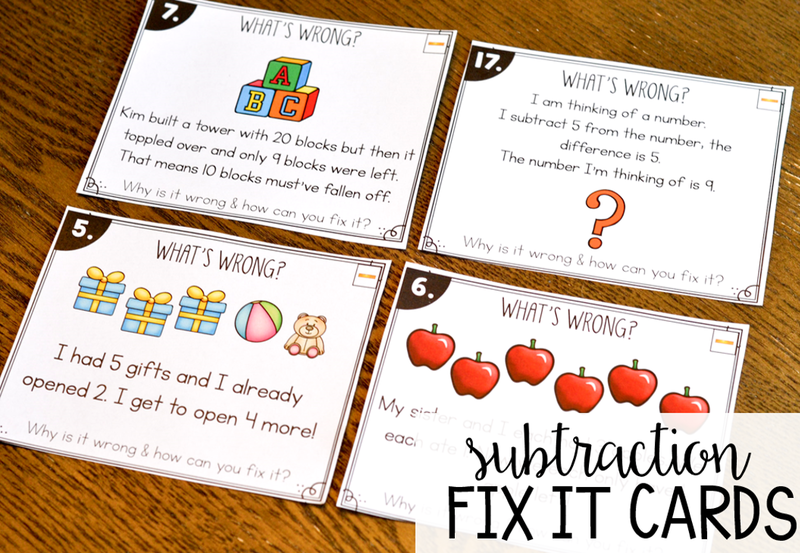 I love to do this in my classroom with “fix it” cards! 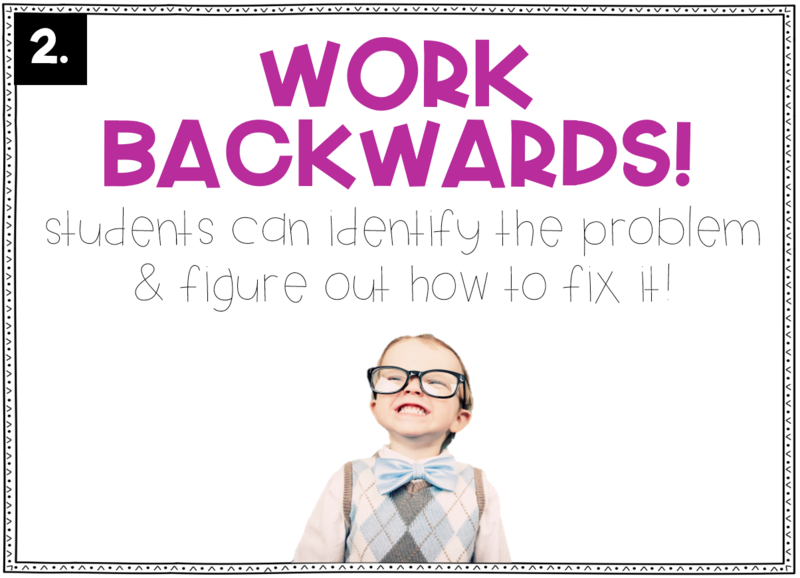 Identifying the problem and fixing it requires students to completely understand the skill at hand and then analyze the situation to determine what is incorrect. Then, students can go about solving these in more than one way! For example, in number 5 shown above, I have had students “fix” a problem like that by saying “they only get to open 3 more, not 4” and I have also had a few students say “They must have had 6 gifts.” Both are correct and they both show that the student understands subtraction! 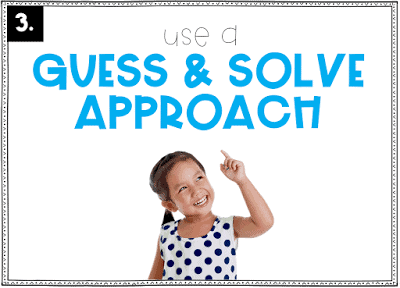 During my math warm up time, I love to pose simple guess & solve problems to get students thinking about how they would come up with a solution. 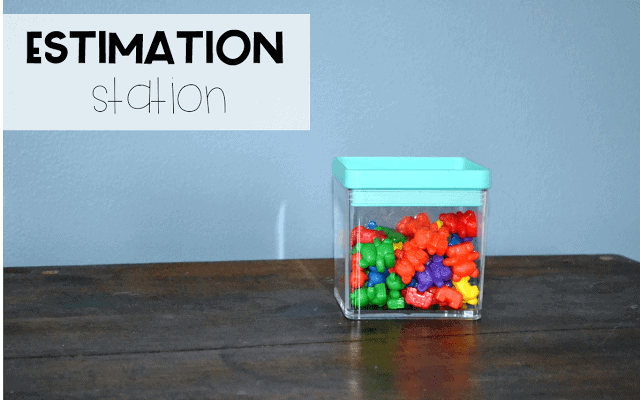 I do this in two general ways: Estimation Station and More/Less. This can be done by putting items into a clear container or bucket and asking students to estimate how many ______ they think are in the container. We write down our guesses and possible ways to figure out how many are inside. After repeating this with your class a few times with the same container, it is fun to hear their reasoning for their estimates. They may notice that the items are much larger than ones used previously so there is likely less in the container. Once my students grasp that idea, I start putting items in different sized containers. Depending on the type and amount of items, we also discuss should we group the items to count them? How can we make sure we don’t count the same small item twice? Etc. We don’t just estimate items in containers either. We estimate how many markers we can lay across the board, how many one-foot hops we can do in 30 seconds, and how many steps it takes us to walk from one door to the other. There are many things to estimate! This activity is a switch up from estimation station, where I will pose the following types of statements and my students will use their reasoning to decide if my statement is correct or incorrect. – There are MORE than 30 counting bears in this container. – It will take me LESS than 20 steps to walk from one end of the rug to the other. – I can do MORE than 25 sit ups in one minute. – There are LESS than 50 books on that shelf. These types of statements have students thinking differently. I could easily ask my students to just count how many bears are in the container to see if they are able to count accurately, but this way my students must pick a side. Do they agree or disagree? They must provide reasoning for their choice and they then will figure out the best way to prove or disprove my statement! Where can I find the Dress Teddy paper? These are great ideas. 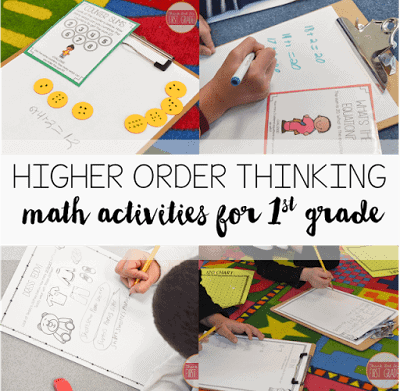 Higher order thinking is so important it needs to start as early as possible. Great post. 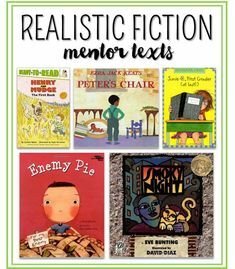 I would love to receive emails on higher level questioning to incorporate into the classroom.